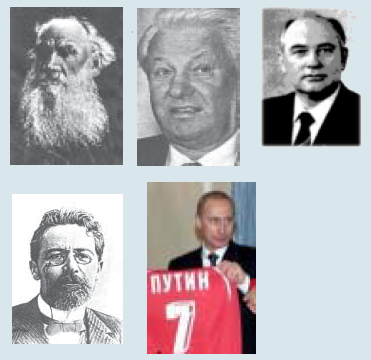 For each of these famous Russians give the full name, from top left to bottom right. Find the names in the box. - Ð­Ñ‚Ð¾ Ð›ÐµÐ² Ð�Ð¸ÐºÐ¾Ð»Ð°ÐµÐ²Ð¸Ñ‡ Ð¢Ð¾Ð»Ñ�Ñ‚Ð¾Ð¹. Ruslan 1 Workbook. Lesson 3. Exercise 15.